Dereham goes interactive: the first text-voting PB programme in the UK? ‘InterACTIVE funding’ was part of a recent £50,000 Participatory Budgeting (PB) scheme across Breckland, Norfolk, delivered by local organisations in partnership with the Breckland Pride Board. Cllr Lynda Turner, Breckland Council Executive Member for Community and Environmental Services said: “This is a fantastic opportunity for clubs and organisations that just need a little funding to get their projects off the ground, and I look forward to seeing some great new initiatives happening in the district. £10,000 was available to each of five Breckland ‘neighbourhoods’. A Community Panel made up of local community representatives and Elected Members was set-up for each to directly involve local people in taking decisions on the allocation of funds for their neighbourhood. 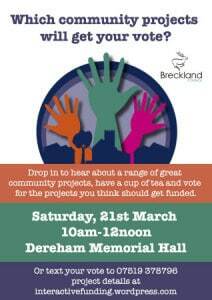 In the Dereham area they held an event with project stalls and using sticky dots for voting, with some 100 people through the door on the 21st March 2015 and an announcement at the end of the event by Dereham’s Town Mayor. And in what the PB Network believe is the first use of SMS text voting, they got another 379 votes collected in just a couple of weeks. They achieved this simply using a £2.99 SIM card in a secondhand iPhone and a widely available app to transfer the numbers and votes into an Excel spreadsheet. Another example of PB innovation happening at the grassroots. Rob Walker, Breckland Council Assistant Director, said: “There has been a fantastic response to the Participatory Budgeting scheme from the local communities throughout Breckland. It is truly heartening to witness just how many groups are passionate about improving facilities for their local area and have come forward with innovative and inspirational ideas.